Zaria Forman has made it her life’s mission to communicate the urgency of climate change through art. Following in the footsteps of her late mother, she travels to the far corners of the world to capture the beauty of landscapes in flux. 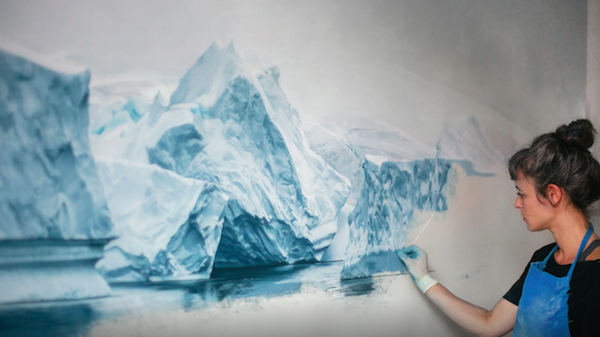 Armed with only chalk pastels, her fingers, and some photographs, she painstakingly created massive drawings of glaciers she visited in Antarctica and Greenland. The size and exacting detail in Forman’s drawings are intended to elicit a visceral connection, emulating the overpowering experience of standing next to a glacier according to this Glacier Hub article. Even from the screen of your laptop, you can almost feel them sweltering in their warming climate. Her mastery of colour, light, texture, and contrast has this effect. The monumental scale and vivid detail of her drawings illuminate the magnificence of the north; however, they embody a much deeper meaning. While visiting Greenland, Forman learned from locals how much climate change has altered their way of life. 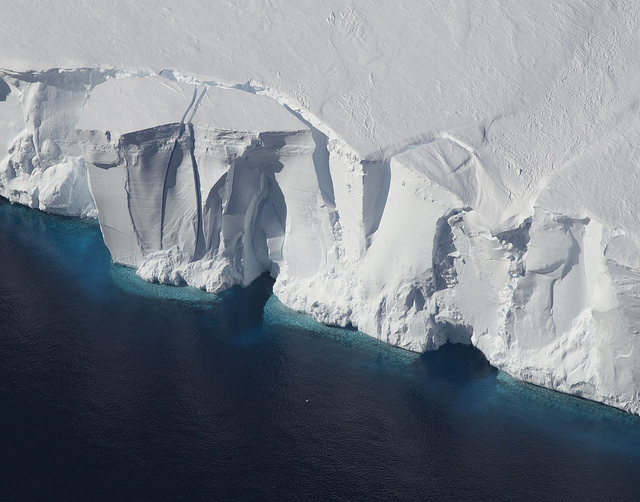 It can often feel distant and abstract to many who live far away from regions feeling the effects of melting ice sheets, rising sea levels, and eroding coastlines. Her drawings of electric blue and frosty white glaciers are intended to help viewers build a more tangible connection with these landscapes. In fostering an appreciation for them, she hopes to inspire viewers to take action. In a Climate Central interview, Forman states that “art inevitably creates an emotional response”. Since climate change is one of the key human imperatives of the 21st century, art is the perfect medium to communicate what scientific data cannot. Forman traveled to Antarctica in 2016 with NASA scientists working on Operation Icebridge (check out this awesome documentary to learn more). During this trip, she witnessed their research in action, which inevitably influenced her artistic approach, and shared her experience during the expedition with her 150K+ Instagram followers. Her artistic reach and use of social media offered new insight into polar ice research. She was also able to capture aerial photographs made possible by NASA scientists. This unique partnership, merging art and science, truly demonstrates the power of collaboration. Foreman’s ideology on communicating climate change is very much in line with our thinking here at CRC Research. In her artistic practice, she focuses on the beauty of the landscapes rather than the devastation. She wants to empower and inspire her viewers, not overwhelm or depress them. She uses her drawings to convey hope—a message not commonly associated with climate change. A reproduction of her drawing, entitled “Whale Bay” (Antarctica, No. 4, 84x144, 2016) is currently part of the Climate Museum’s first exhibit, In Human Time.